Americana from L & T Respess. 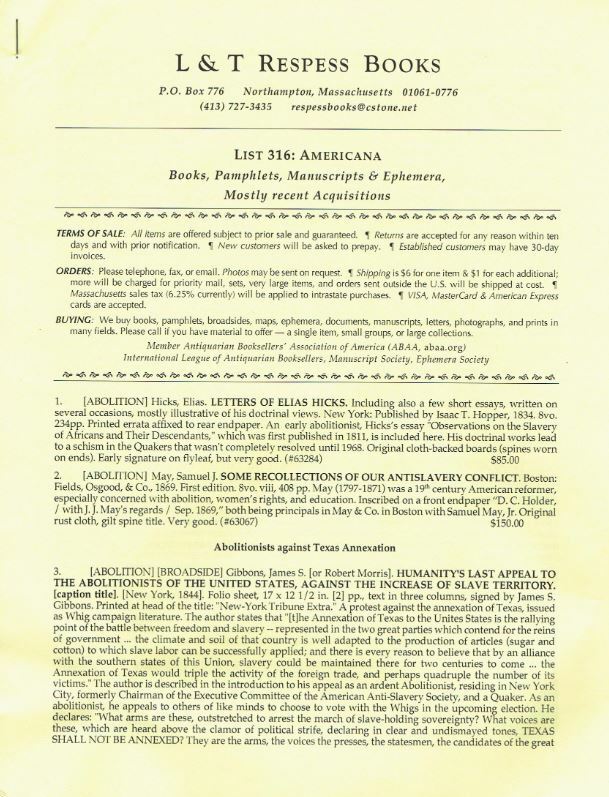 L & T Respess Books has issued their List 316: Americana, featuring books, pamphlets, manuscripts & ephemera, mostly recent acquisitions. Dates range from the 18th to the 20th century, with the bulk of the material right in the middle - the 19th century. Most of the items are uncommon, or in the case of some ephemeral material, unique. As a group, the works provide a fascinating look at America from their time, rather than from hindsight. There is good and there is bad, but for Americans, it is us. Here are a few selections. We begin with a Civil War item. It is not the typical piece of Civil War history or memorabilia. It is an unassuming manuscript notebook that reminds us of the the horrors of that war in the bluntest, most matter-of-fact way possible. It is a notebook that was kept by Dr. John M. Evans from June 22 to November 10, 1864. Dr. Evans was a physician serving with the 13th Wisconsin Voluntary Infantry. He was stationed at the Decatur Hospital in Decatur, Alabama. By that time, Decatur had been captured by Union forces as part of Sherman's march toward Atlanta. Still, there were battles and skirmishes taking place in the area. Dr. Evans' notebook contains a listing of patients who died in the Decatur Hospital during that time period, six double pages with 110 names. Most of them were Union soldiers from the Midwest, but there were also a few Confederates from Alabama and four U.S. "Colored Troops." There was also one unidentified Union soldier whose body was "found in the river." Dr. Evans survived the war and returned to his home in Evansville, Wisconsin. He was the town's first mayor, postmaster, and a state legislator. Originally known as The Grove, Evansville was renamed for Dr. Evans. It is today a town of 5,000 residents. Item 50. Priced at $1,500. All of that artillery fire during the war had an unintended secondary consequence beyond killing a lot of people, or so believed Edward Powers. Powers believed it was causing a whole lot of rain. He fought during the Civil War and noticed that frequently, a day or two after battles, there would be rain, often a drenching. He set about getting quotes from fellow officers who noticed the same. Of course, the Civil War was fought in the South, an area which normally receives plentiful rainfall. In 1871, Powers wrote a book about it, War and the Weather. In 1890, he published a revised edition, of which this is a copy. This time, it had more impact. Scientists and meteorologists by then had a fairly good understanding of what caused rain, and considered this theory to be nonsense, but politicians are not always swayed by science. Congress authorized the expenditure of $9,000 to test the theory. Tests were conducted in Texas during a drought, and low and behold, in some cases there was rain. Ignored was the fact that tests were conducted just as the rainy season was beginning. Results were played up and exaggerated by the participants and press, while the comments of meteorologists were ignored. The result was Congress authorized a second expenditure in 1892, and this time, there was no rain. The press turned on the experiment, which quickly faded into history. Item 129. $85. Here is a less than pleasant sounding title for a tale of intrigue and murder: I Saw Three People Die in the Electric Chair or the End of One of South Carolina's Bloody Feuds. The author was local evangelist W. Roy Stewart, the book published in 1943. It all started when a mule kicked a prize calf, and ended up with eight killings, including a sheriff and deputy, in this battle between the Logue and Timmerman families. The three executed were Sue Logue, her brother-in-law George Logue, and a hired killer. They had a member of the Timmerman family killed in revenge for earlier killings. Adding to the intrigue was the name of the judge, the young, then unknown local judge, Strom Thurmond. The venue had to be changed because Thurmond had been carrying on an affair with the widow Logue. Thurmond was elected Governor of South Carolina in 1946, and in 1948 ran for President as the segregationist "Dixiecrat" candidate, carrying four states. He later served 48 years in the senate, retiring in 2003 at the age of 100. Stewart visited the Logues in prison, recorded their final thoughts, and provides some expected morals from the story. Item 173. $225. Item 150 is a 13" x 42" poster circa 1890 for The Davis Sewing Machine Company, Dayton, Ohio, U.S.A. Davis was formed in 1866 in Watertown, New York, achieving great success due to its advanced technology. In 1889, they were enticed to move their operations to Dayton. The enormous factory depicted on this poster covered 7 acres. By 1892, Davis expanded production to include bicycles, and at their peak, employed 2,000 people, turning out 600 sewing machines and 600 bicycles a day. The image on this poster shows neighboring streets, trains that served the plant in the background, people riding in horse-drawn carriages on the street. Davis' sales grew as it supplied sewing machines to Sears, Roebuck, but ran into financial problems after losing that account. It was forced to sell off its assets in 1922. $850. Item 17 is a broadside for something that sounds like a treat - Roberts' Worm Candy. Actually, this was not candy made from worms, nor candy made for worms. It was candy meant to remove worms from your stomach or intestines. Roberts was Seth Willis Roberts, an established and apparently respected pharmacist in Mobile, Alabama at the time, which was around 1870. The broadside also contains a 20-line poem, discouraging parents from giving their children calomel, which was used to kill worms, bacteria and serve as a purgative. It describes calomel as toxic, which is true of this mercury compound no longer used as medicine. $225. L & T Respess Books may be reached at 413-727-3435 or respessbooks@cstone.net.